Looking for his first win with the West Michigan Whitecaps (15-14), big righthander Sandy Baez (0-4, 4.76 ERA) took to the hill to face the Lake County Captains (20-12) in the second of their three-game road series. 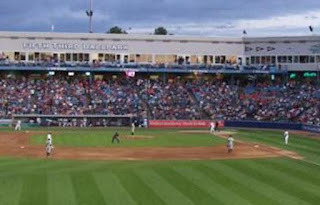 The Whitecaps struck first, courtesy of an RBI double from Will Allen in the fourth inning, giving Baez minimal support towards his five inning outing. Baez fanned six against the Captains, allowing five hits, holding Lake County scoreless until a four-run sixth inning from the Captains put the final nail in the coffin. Aside from the pair of hits for West Michigan from Allen, the Whitecaps were held to 7-for-32 at the plate. A lack of offense forced Baez to be credited for his fourth loss this season as Lake County evens the series at one game apiece. Coming up next: Both clubs return to Classic Park on Wednesday afternoon for an 11:00 am contest that will send West Michigan righty Jordan Smith (3-0, 3.86 ERA) to face Lake County righthander Casey Shane (3-1, 2.35 ERA) in the series finale.